Steon Lighting now offer a Self-Test, integrated emergency lighting system which can be incorporated into many of our luminaires. Emergency Self-Test allows building owners and responsible persons to prove their emergency lighting systems are working correctly without having to test each individual unit. Automatic testing is far more effective and more reliable than manual testing; requiring little or no input from the building manager or maintenance team. Installing a self-testing emergency lighting system is one of the most effective ways to meet emergency lighting regulations. These systems remove the need for manual key-switches to manually test and record every emergency light fixture within a building – or across an entire estate, which is far less demanding in terms of time and resources. If failures are indicated when conducting the tests, maintenance personnel are notified via a visual indication at the luminaire. This not only saves maintenance and facilities personnel from having to test every individual light, it means they are only required to attend to units with reported faults. Automatic emergency lighting testing is a more cost-effective option, costing less overall to own and maintain, while also providing reassurance to building owners and occupiers that they are in compliance with building regulations. As an added benefit, all Steon Self-Test units which feature LiFePO4 batteries undergo a unique battery regeneration process; During the automatic commissioning phase three full charge/discharge cycles are carried out in the first eight days of installation. This not only ensures compliance to regulations but also maximises battery reliability and longevity. Commissioning phase: 3 full charge/discharge cycles during the first 8-days. Every 2-months: a full duration test is performed. If you require any additional information regarding Emergency Self-Test please don’t hesitate to contact us. Appendix: Key Advantages of LiFePO4 battery. Lower parasitic load (power consumption) – NiCd batteries require constant trickle charging to maintain their charge. Whereas the low self-discharge of the LiFePO4 batteries means that ‘pulse charging’ is sufficient to maintain charge. This reduces power consumption by over 90% in standby mode, which when extended throughout multiples of luminaires within a building, could make a significant energy cost reduction. Longer Life – in accelerated testing LiFePO4 batteries still last 3-hours after a 12 year simulated lifespan and as such the envisaged life expectancy should be between 4 to 8 years dependant on application and operational usage, with 8 years not being unrealistic. 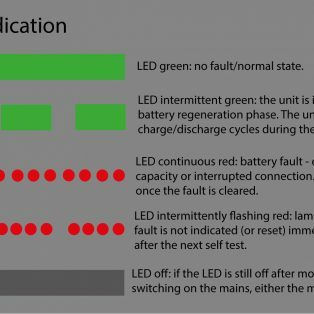 Furthermore, the intermittent charge cycle means that battery and control gear temperatures are significantly reduced vastly increasing the life expectancy of the luminaire. Reduced environmental impact – Cadmium used in NiCd batteries is highly toxic and the manufacturing process is detrimental not only to the environment, but also to worker’s health. Globally, governments are attempting to ban NiCd batteries, but historically there have been no suitable alternatives. NiMH batteries were thought to be the next step, but they are simply not reliable enough. The introduction of LiFePO4 batteries provides a solution to overcome the shortcomings of using NiCd batteries.